(1) A-WEEMA-WEH. Derek Kunsken, one of the guests of honor, tells Black Gate readers about “The 4th International Science Fiction Conference, Chengdu, China, November 2017”. …Incidentally, China is interested in hosting a WorldCon, and some of my expedia searching has shown me that flights from Ottawa to Chengdu were in the neighborhood of $900 Canadian, and the hotel they got us in downtown Chengdu was about $110 Canadian a night. I don’t know how much more or less expensive that is compared to Helsinki or Dublin, but I would vote for a Chinese bid on a WorldCon! …Derek Künsken writes science fiction and fantasy in Gatineau, Québec. 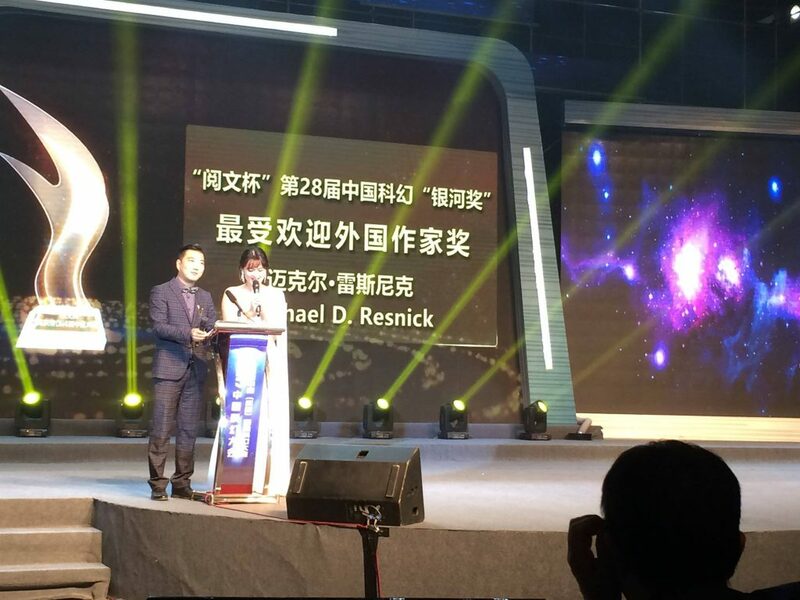 His first novel, The Quantum Magician, is being serialized right now in China in the magazine SFWorld before its publication in book form in the spring. If you look at what’s playing on your television, at what’s showing at the local cinema, at what video games your children are playing, or at what is selling in the young adult section of your neighborhood Barnes & Noble, you’ll see something that is at once deeply cultural and deeply countercultural at the exact same moment: Romanticism. From its earliest origins, one can trace Romanticism’s history through the 19th century and into the early 20th century through figures as diverse as Friedrich Nietzsche, G.K. Chesterton, and Willa Cather. Perhaps most importantly for Western culture, however, was its manifestation in the vast mythology of J.R.R. Tolkien…. (3) TOP LGBT SFF. Rocket Stack Rank has consulted the ratings for excellent stories and come up with the “Best LGBT Science Fiction & Fantasy of 2015-2016”. 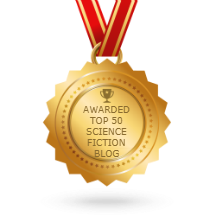 In addition to regular monthly ratings we’re going to start publishing occasional lists of excellent stories from particular subsets of Science Fiction and Fantasy (SFF). We’ve previously done this for Hard Science Fiction, and this month we’re doing it for Lesbian, Gay, Bisexual, and Transgender (LGBT) stories. As always, our focus is on the stories, not the authors. These are stories with memorable LGBT characters—not necessarily stories by noted LGBT authors. These include excellent stories in which a key character merely happens to be an LGBT person as well as stories where the LGBT angle is crucial to the plot. (4) BLACK FRIDAY. New Zealand’s Weta Workshops is running a Black Friday sale through Monday. All kinds of figures and paraphernalia from Lord of the Rings and other films they’re associated with. (5) UNICORN ANTIDOTE. This will cure your post-ceramic stress — JJ calls it “Brain bleach for the wine caddy.” If you need that explained, consider yourself lucky. So according to a sequence of increasingly puzzling emails from @amazon, Clockwork Boys shipped both yesterday and today, will not ship until Monday, AND will be arriving by… half an hour ago. It seems about right that @UrsulaV would have written Schroedinger's Book. I’ve mentioned in a past article that Britain has Dan Dare, Pilot of the Future. Now we also have Colonel Steve Zodiac of the World Space Patrol. Not the hero of a comic strip, but rather of a children’s television show from Anderson Provis Films (APF), which you may all remember from when I talked about their production last year, Supercar. Gerry and Sylvia Anderson are back with another Supermarionation series, Fireball XL5. Supermarionation is their term to describe puppets that speak using electronic synchronization, and the Andersons have used it to great effect, creating a brand new medium for SF. (8) KIT SHIRT. 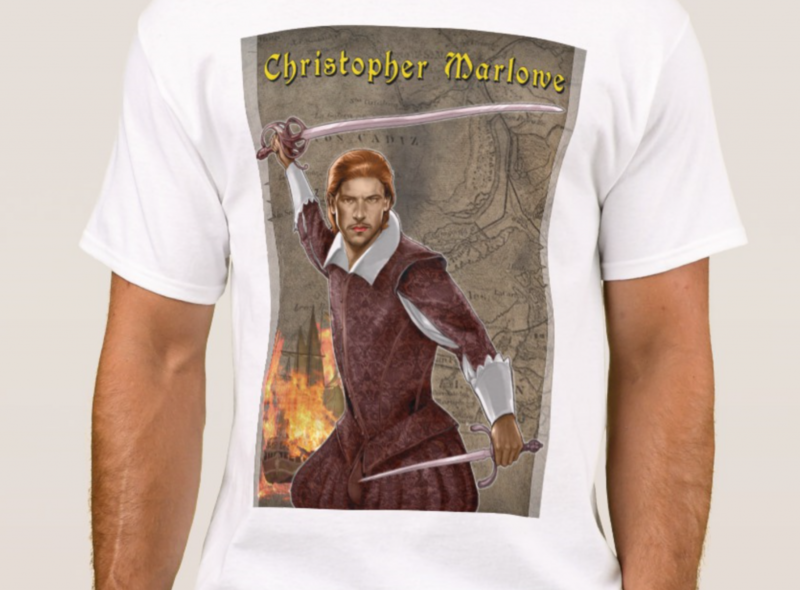 Francis Hamit, whose movie script has been winning prizes, offers the “Christopher Marlowe fan T-shirt” through Zazzle. 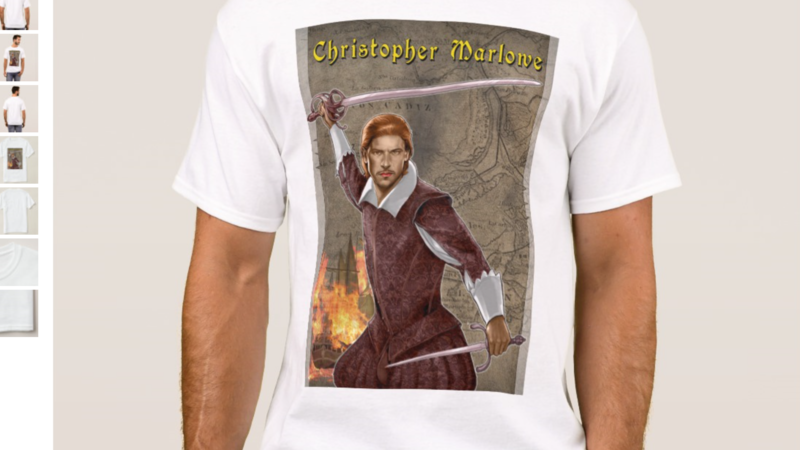 Check out the CHRISTOPHER MARLOWE fan t-shirt that I designed at Zazzle.co.uk. We did this because we have about 1,400 Facebook friends in London and we need to sell something to prove that we are actually in business. Zazzle seemed like the easiest way to do this and we already own the art. We also have a similar product. on CafePress. John King Tarpinian knows you music lovers will get the joke in today’s The Argyle Sweater. Gattiss’s next project, with Mark Moffat, is a version of “Dracula” which will appear on the BBC in 2019. (11) WORTHY OF THE VOGONS. History.com found a by-product of its cipher-cracking project: “This Supercomputer Was Programmed to Think Like the Zodiac Killer. No Wonder Its Poetry is So Creepy”. Now Knight, CARMEL and a team of code-breaking researchers are working with the HISTORY Channel to try and crack the Z340, the Zodiac killer’s most impenetrable cipher. In the late 1960s and early 1970s, the self-named murderer terrorized Northern California with a succession of random killings and taunting letters to the police and newspapers. Four of those communiqués contained ciphers filled with perplexing letters and abstract symbols. Cryptologists consider the Zodiac’s 340-character cipher, sent to The San Francisco Chronicle in November 1969, a holy grail of sorts. As part of Knight’s research into what computers can do with language, CARMEL can churn out complex verse on any given topic within a matter of seconds. (12) PARTS OF SPEECH. Fast Company explains why “John Waters Doesn’t Need To Make Movies To Make Trouble”. Understandably, the speech went viral, or as Waters puts it, “it had a little trip.” In April of this year, the speech was turned into a book called, Make Trouble. Now, that book has been turned into a vinyl record of the same name, released by Jack White’s Third Man Records. Waters recorded the audio at his dining room table in his New York apartment in an afternoon. “But it took me three days to write it,” he says in mock defensiveness. (13) SCORING THE COVERS. Camestros Felapton has started the ball rolling with “The Book Cover Thing 2017: Draft Long List”. Jump over and add your suggestions. A reminder of how this works. There is no eligibility period. A draft long list is made from finalist from the Hugos, Nebulas and Clarke Awards, as well as the winners of book categories from the Dragons. To the long list we add book covers suggested in the comments by anybody (and yes that includes Phantom as per last year). Also I may add additional covers to keep it interesting. The covers are then scored on a set of criteria (see below). Points are totaled and the highest scoring cover(s) are the winners. Winning artist/designer gets a JPEG of Timothy. Helen Marshall is the guest editor for this year’s book. An award winning writer and creative writing lecturer, she comes at weird fiction from a very different angle to last year’s editor Simon Strantzas. This is no bad thing. The key to weird fiction is its malleability. Last year, Strantzas put together a very horror centric anthology, with weird fiction’s key players such as Robert Aickman, Rob Shearman (who will be guest editing volume five) and Ramsey Campbell at the forefront. Marshall instead has assembled a vastly different kind of anthology, which demonstrates the vastness of the genre. Yes, there are horror stories in here, most notably Usman T Malik’s ‘In the Ruins of Mohenjo-Daro’, but then there are also stories like Irenosen Okojie’s magnificent ‘Outtakes’, or Aki Schilz’s ‘Beating the Bounds’, both of which are highlights of a brilliant book. (16) LOOKING AHEAD. Paul Kincaid, whose book about Iain M. Banks came out earlier this year, talks about his next book in “A Priest chronology”. So, my next book will be about Christopher Priest and will be published by Gylphi, which is something that makes me inordinately pleased. I’ve started the reading and note taking that inevitably accompanies such a task. But I’ve also put together a chronology of his books and short stories, just as a way of keeping everything straight in my mind. Review: C3PO is a pretty simple recipe. It more or less consists of a can of crushed pineapple with chopped bell pepper, onion, and pecans all mixed into a pile of cream cheese. That is basically it. The only change I made from the text of the recipe was that I used a red bell pepper instead of a green bell pepper, mostly because I had a red bell pepper on hand. The end result is a spread than can be used on crackers or fresh vegetables. The end result is also delicious. (18) AN ETHNIC FIRST. The Washington Post’s Noah Berlatsky, in “With ‘Justice League,’ now there’s a Jewish superhero played by a Jewish actor on the big screen”, notes that The Flash is the first movie superhero to be Jewish, and he looks at other Jewish superheroes in the comics, including The Thing, who was revealed to be Jewish in the early 2000s. I’m sure this statement will provoke some disagreement among people who pay attention to firsts in films. Depending on how you look at it, you could argue that the first superhero was also the first Jewish superhero. Superman, after all, was created by two Jews, Jerry Siegel and Joe Shuster, and fans have found some (often overstated) traces of Jewish cultural influence in his creation. There’s also Thing of “The Fantastic Four,” who wasn’t officially declared Jewish in the comics until the 2000s, and hasn’t been identified as Jewish in the films. But he was often seen by fans as a working-class ethnic stand-in for his creator, working-class ethnic Jew, Jack Kirby. The X-Man Kitty Pryde was Jewish in the 1980s, and the X-Man villain Magneto was retconned into a Holocaust survivor at about the same time. Flash, though, is the first character in our ongoing superhero film frenzy who is identified specifically as Jewish — he mentions he’s Jewish quickly, offhand, when he first meets Batman (Ben Affleck). (19) SCORCHED PLASTIC. The Lego Millennium Falcon – if you haven’t already ordered, you’re screwed: “What’s $800 And Already Sold Out? This Lego Star Wars Ship”. It made the Kessel Run in less than 12 parsecs. But a new buildable version of Han Solo’s famous Millennium Falcon is currently stalled. Those hoping to snag one of Lego’s new Star Wars sets for the 2017 holidays will likely be disappointed. It’s currently sold out online. After a September release only to its VIP list, the company promises it’s working as fast as it can to “make more sets available and keep our LEGO builders happy.” At a cool $799.99 and more than 7,500 pieces, it’s the expensive, easy-to-lose gift that keeps on giving. Dang, these went faster than Worldcon 76 hotel rooms. (20) FOR YOUR TREE. Of course, these are still available — “Holiday Gift Idea: ‘Elvira Christmas Ornament’”. I don’t suppose that comes as a surprise. Sculpted by artist MATTHEW BLACK and painted by DAVID FISHER, these specialty Mistress of the Dark ornaments come in two versions; Standard has Elvira in black dress, while the Limited Edition has her in red and is limited to 500 pieces. The Hugo Awards just called to say that I was PROBABLY going to be named the best new author but I would have to agree to an interview and a major photo shoot. I said probably is no good and took a pass. Thanks anyway! (22) DUDE. Two compilations of “Super Café” videos from How It Should Have Ended.